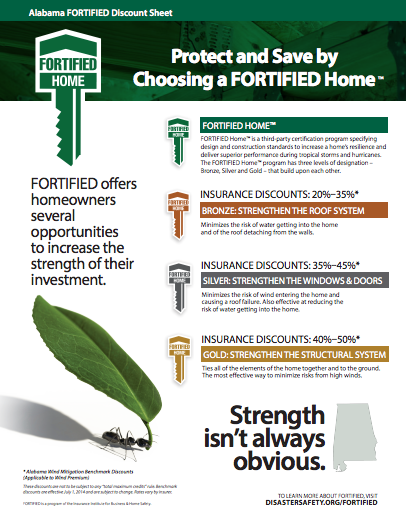 FORTIFIED increases home values and can lower insurance rates. FORTIFIED Testimonial - Dawn Beasley Alabama Realtor Resale Value Part 3 from IBHS on Vimeo. What is FORTIFIED? from IBHS on Vimeo. FORTIFIED is growing and consumers are asking for it. A FORTIFIED home is reducing the cost of insurance, thereby lowering debt to income ratios or the overall cost of homeownership. It also offers homeowners tangible other benefits like increased value, durability and improved safety. Stay ahead of the curve and get to know FORTIFIED. FORTIFIED WISE CREDENTIAL FORTIFIED Wise training opportunities are held on an ongoing basis in locations throughout the U.S., including Mississippi, Alabama, South Carolina, Oklahoma, Rhode Island, and North Carolina. WHY FORTIFIED? It is independently verified giving consumer added confidence, it's renewable, transferable and will strengthen property against storm damage. FORTIFIED INSURANCE DISCOUNTS AND INCENTIVES FORTIFIED™ can qualify homes and businesses for insurance incentives or discounts from state wind pools and certain insurance companies. Some states have even legislated these discounts or credits. EDUCATION We partner with those who homeowners trust and provide education services focused on how to build stronger, insurance, incentives and FORTIFIED. Contact us to schedule your next team training. STRONG IS SUSTAINABLE Building better 1st makes sure investments in energy efficiency and green construction withstand the tests of time and Mother Nature. Small changes and simple steps can save thousands a year. 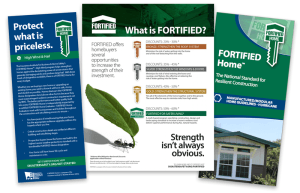 ALL FORTIFIED MATERIALS & RESOURCES FORTIFIED Home™ requirements, benefits, flyers, yard and home signs, logos and other marketing materials.